“Place your hands on the counter, spread your legs, and don’t move,” says the detective on my left. He goes about patting me down. I don’t know what he expects to find; they already did this to me before we got on the plane. “Stand up,” Detective Simon says. I almost laugh at the coincidence of his name and my situation. Simon says take off your shoes and pull out the laces. Simon says take off your belt and bowtie. Simon says take off your watch, wedding band, and hand over your wallet. Glaring at him, I comply. I do everything he demands. I get the sense he likes this part of his job—brandishing the power lent to him by the state over the people. “Go with Detective Raleigh and he’ll get you processed,” says Simon. I look him up and down before following Raleigh a little way away to a corner of the station. Here sits a table with a computer, scanner, and a camera. We stand in front of the computer as he enters my information. When he’s done, he places my right hand on the scanner and it captures my print. We do the same with my other hand. Next, I stand against the wall in front of the height chart and that’s when everything becomes surreal. I can’t believe I’ve actually been arrested. My freedom, which up until now I’ve considered a God-given right, has been demoted to a privilege and now lies in the hands of people who don’t know the first thing about me. Raleigh takes a frontal shot of me then tells me to turn to my right. I take in a sharp breath as I turn and an unnerving nausea settles in the pit of my stomach. 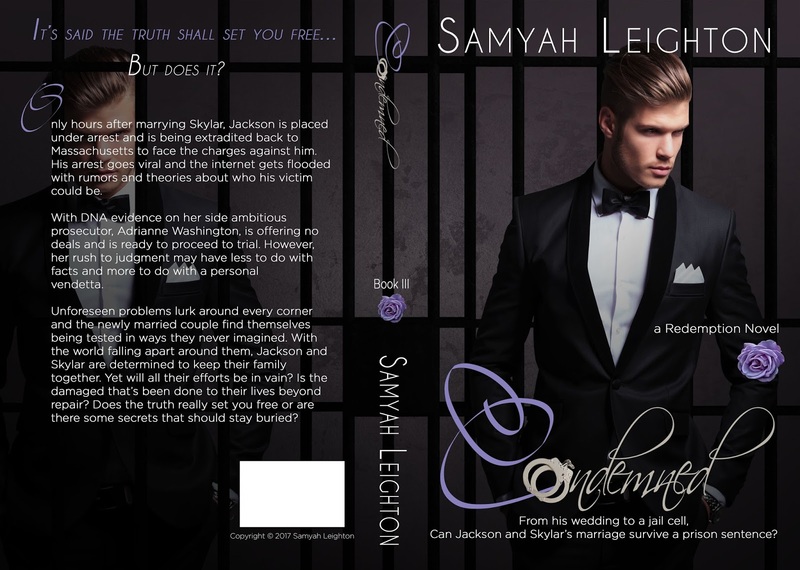 Author Bio: Samyah Leighton is a wife and mother of four. She's always had a passion for writing and storytelling. She loves to read. Romance and erotica are her favorite genres. Samyah loves all kinds of animals and movies and music. She loves to cook and bake and window shop. She finds beauty in all types of love. For the most part Samyah enjoys the simple things in life. Samyah Leighton is a loving wife and mother of four. She's always had a passion for writing and storytelling. She loves to read. Romance and erotica are her favorites genre. Samyah loves all kinds of animals and movies and music. She loves to cook and bake and window shop. She finds beauty in all types of love. For the most part Samyah enjoys the simple things in life.